Whilst you’re enjoying your stay in the beautiful country of Cyprus it is highly unlikely that you are going to spend any of your time in doors. Temperatures are nice the majority of the year if not a bit too hot. Here are some ideas for great outdoor activities in Cyprus that will keep you cool in the summer and active in the winter. Your stay In Cyprus will be mainly outdoors and as adventurous as you can handle! 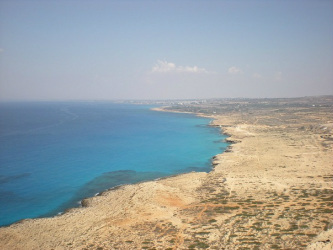 Cyprus is well-known for its beautiful scenery and part of this includes it’s beaches and clear blue waters. Of course what could be a better way to experience this than water sports? There are many water sports available to anyone on many of Cyprus sandy beaches where you can simply go on the spur of the moment and take part in whatever activity you are interested in. If you have never done a water sports before, there are plenty of teaching facilities at hand; so why not try out one of the following fun filled sports: Jet Skiing, Water Skiing, Scuba Diving, Wake Boarding, Knee Boarding, Banana and Ringo Riding and speed boat hire. Taking on one of these great activities will keep you busy for hours or days and you may even learn a new skill and get some great underwater photos from night or day scuba diving. If the water isn’t your thing, don’t stop reading; there are many other great outdoor activities in Cyprus available for those who aren’t as fond of the sea. Besides its gorgeous beaches, Cyprus has also brought great interest in its other landscapes; and this has opened the doors for hikers that enjoy a nice long walk with some beautiful scenery. At one point hiking wasn’t extremely popular however as more and more people take part and enjoy what sights this country has to offer, it gets more interest by the day. It’s a great way to stay outside and get some fresh air in the unspoilt countryside. There are many outposts that offer guides for hiking expeditions and they are great value for money. Birdwatching, horseback riding, paintball, and geocaching are other popular activities that a lot of people take part in. And of course, don't forget skiing in the Troodos mountains during the winter months. Ever wanted to take out a quad bike? Or maybe you just fancy a nice quiet cycle? Cyprus has many sand and earth tracks available for both types of transport. There are many different routes you can take to have fun on the sand or enjoy peaceful wildlife whilst on a hired cycle or quad bike. Some tracks take you up challenging mountains which return with amazing views when you meet the top, and if this isn’t your thing the villages and towns are more than good enough for a peaceful ride. If you prefer to just have some family fun with quieter or less rigorous activities you can always go see a movie, go bowling, or relax by an outdoor pool. In Paphos, there are many art and pottery studios where you can go watch or learn a new craft such as making your own mosaic or clay pottery. Cyprus really is a beautiful and fun filled country, and you are bound to find outdoor and indoor activities in Cyprus that attract all the family to join in and have a great time.